Having worked as an analyst for Continental Grain Company for 22 years, Paul McAuliffe understands the world grain market. He also knows what makes our export competitors tick. He currently operates a consulting firm which dispenses advise on international marketing and risk management to grain industry clients, including traders, elevator managers, transportation merchandisers and bankers. What this means is that Argentina exports all output not needed domestically, keeping ending-year stocks at approximately pipeline levels. No matter what the situation—high or low prices, favorable or unfavorable exchange rates, etc.—excess production is floated out of Argentine harbors to the export market. 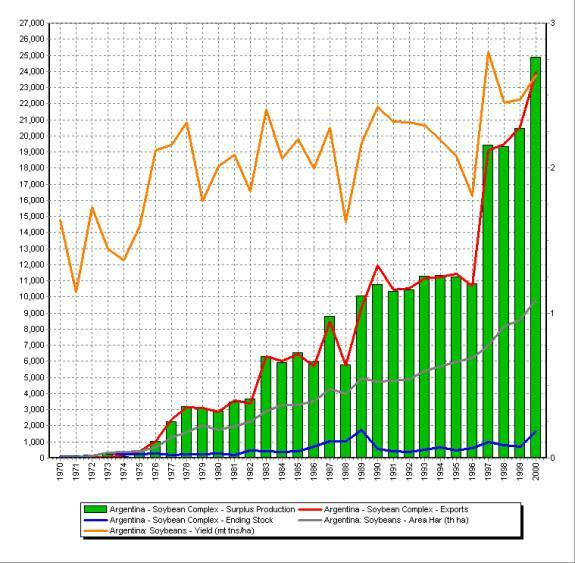 While McAuliffe was referring to wheat, the data suggest that Argentina follows the same approach with soybeans. The line graph near the bottom of figure 1 shows relatively stable combined stock levels of Argentine soybeans, soybean meal and oil stocks. Figure 1. 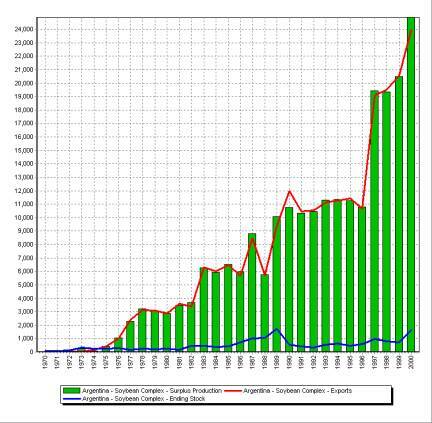 A comparison of Argentine surplus soybean complex (soybean, soybean meal, and soybean oil) production and exports. Also included is the carryover level. Looking at the chart it quickly becomes apparent that if the Argentines produce an agricultural product they sell it in the year of production. Argentines do not hold on to stocks in hopes of higher prices in a coming year. Data source: USDA PS&D. The enormous success that Argentina has had dumping soybean and soybean products into—what seems to be for them—a bottomless export-pit is shown by the almost one-to-one correspondence between production in excess of domestic demand of soybean complex products (bars) and exports of soybeans, soybean meal and oil (line graph near bar tops). In years where exports are slightly smaller than the surplus production, the differences are often the capacity of a Panmax freighter load or two which then show up in the export numbers of the next year. The 1997 leap in exportable surplus sticks out like a sore thumb. What caused this? Was it because soybean acreage increased sharply in response to relatively “high” soybean and soybean meal prices in 1995 and 1996? To address that question, we have constructed figure 2 by superimposing line graphs of harvested area and yield on the graphs shown in figure 1. While harvested area increased in 1997, the increase was not sufficiently large to explain the jump in exportable surplus. It was a bumper yield that caused the increase in 1997 production surplus. Figure 2. A comparison of Argentine surplus soybean complex (soybeans, soybean meal, and soybean oil) production and exports. Also included is the harvested area and yield. Argentina has been expanding its soybean area at a steady pace since the mid-70s. The variability in exportable production is directly related to yields. Data source: USDA PS&D. In fact, most of the variation in exportable surplus has been due to yield fluctuations. Also, note that even though soybean prices declined sharply in the late 1990s, Argentine soybean acreage continued to increase at roughly the same rate as when soybean prices were relatively “high” in previous years. One more thing on exchange rates. The Argentine currency has been pegged to the U.S. dollar since 1992. Thus, any exchange rate advantages or disadvantages compared to our export customers or competitors are also shared by Argentina. Figure 1 clearly suggests that Argentina does not pay attention to exchange rates, U.S. or world price levels or anything else except whatever it takes to shove surplus production out the export door. One thing we know for sure, the U.S. was not beat out of soybean complex exports because Argentina had more favorable exchange rates than the U.S. It seems abundantly clear that Argentina’s behavior has been affected very little by the U.S.’s dismantling of price-support floors, allowing prices to fall well below the full U.S. cost of producing soybeans. The increase in area planted to soybeans in Argentina continues unabated and, as the data and McAuliffe confirm, Argentina continues a longstanding practice of undercutting U.S. prices to sweep out crop bins into the export market even though prices stand (crouch?) at nearly half their peak levels. The behavior of the Argentines calls into question the U.S. “lower-our-price” policy direction.